A knightess showed up in a one room apartment all of a sudden! "The world shall be saved by you, Hero…"
Yeah… The encounter was really sudden. 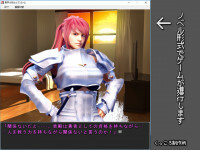 An ADV game with 3DCG.